Warning: Major SPOILERS ahead for the 12/29 television taping of WWE SmackDown Live, which is set to air this coming Tuesday night on New Year’s Day. 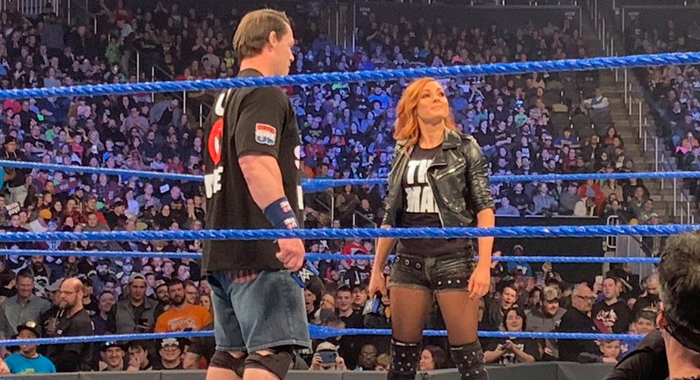 As advertised, John Cena made his highly anticipated return to WWE television this Saturday night at the Smackdown Live television tapings in Pittsburgh, PA. The 16-time world champion soaked in the traditional mixed reaction he has become accustomed to over the years, but didn’t have very long to enjoy the moment, as the so-called “greatest of all time” ran right into The Man. The two did end up getting on the same page — for the most part — picking up a victory over Andrade Cien Almas and Zelina Vega in mixed tag team action. However, after Cena hit his patented Five Moves of Doom looking to put away El Idolo, Lynch surprisingly threw her own partner out of the ring, rolling Vega up into the Disarmher, and won the match for herself.